Ontario’s first European Community, Sainte-Marie among the Hurons was the headquarters for the French Jesuit Mission to the Huron Wendat people. In 1639, the Jesuits, along with French lay workers, began construction of a fenced community that included barracks, a church, workshops, residences, and a sheltered area for Native visitors. By 1648, Sainte-Marie was a wilderness home to 66 French men, representing one-fifth of the entire population of New France. Sainte-Marie's brief history ended in 1649, when members of the mission community were forced to abandon and burn their home of nearly ten years. 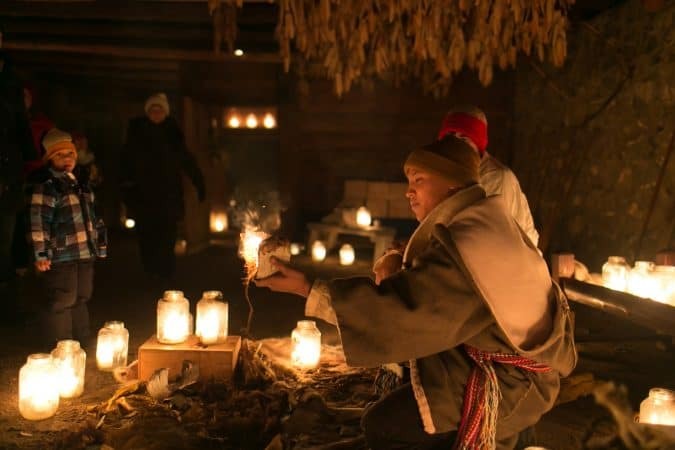 After extensive archaeological and historical research, Sainte-Marie among the Hurons is now recreated on its original site, where the mission’s compelling story is brought to life. Located near Midland in the beautiful Southern Georgian Bay area, this world-renowned reconstruction illustrates the interaction of the French and Wendat nations. Visitors get a unique opportunity to see the earliest Canadian pioneer life, through guided or self-guided visits, school group tours, interactive education programs, special events, and corporate functions. Visit our Interpretive Museum and themed gift shop, and complete your stay with a delicious meal in Restaurant Sainte-Marie. Sainte-Marie among the Hurons is operated by Huronia Historical Parks, and is an Attraction of the Ontario Ministry of Tourism, Culture and Sport. The story of Sainte-Marie among the Hurons dates back almost four hundred years. Wendake (“the land apart”) was the ancestral homeland of the Huron Wendat nation, a branch of the Iroquoian family. The Wendat were a matrilineal society of skilled traders and farmers. Following the trail of French explorer Samuel de Champlain, French Jesuit priests arrived in Wendake early in the 17th century. An international order, the Jesuits operated like an army, dedicated to spreading Catholicism throughout the world. They believed that the first step in converting a person to Christianity was to educate him. The Jesuits established themselves in Wendake. They travelled from village to village, learning the Wendat language and customs, and preaching to the Native people. Their Superior, Father Jérome Lalemant, dreamed of "building a house apart, remote from the vicinity of the villages, that would serve among other things for the retreat and meditation of our evangelistic labourers." Courageous laymen travelled from France to build a mission on the banks of the Isaraqui (Wye) River in 1639. It was named Sainte-Marie among the Hurons. Huron is the French name for Wendat. Hard work and dedication soon brought Sainte-Marie to virtual self-sufficiency, an impressive achievement for a community 1,200 kilometres from Quebec. It was to last only 10 years. In the 17th century, the land we know as Canada was New France. The population numbered in the low hundreds, and most of the people lived along the Saint Lawrence River, their livelihood based on fish, furs and fledgling agriculture. We know the story of Sainte-Marie among the Hurons from the annual reports written by the Superior at Sainte-Marie. The reports, known as the Jesuit Relations, were sent to France via Quebec. The report written by Father Paul Ragueneau tells us the story of heartbreak and despair that led to the abandonment of Sainte-Marie among the Hurons. In the spring of 1649, attacks by the Iroquois increased. Under growing pressure, the Jesuit missionaries, their helpers and Wendat followers burned the settlement and abandoned it. They fled to St. Joseph Island (now Christian Island), where they endeavoured to establish a new Sainte-Marie. After a terrible winter of starvation and constant attack, the Frenchmen and the Christian Wendat returned to Quebec. The Huron were settled on l'île d'Orléans in Quebec, where the Iroquois attacked the community. The surviving Wendat stayed in Quebec, and eventually gathered at Jeune Lorette in 1697, where they established their Huron culture and a nation known as Loretteville or Wendake. Today, it remains one of the largest Huron Wendat communities in Canada. At Sainte-Marie among the Hurons in Ontario, the grave of the martyred priests Brébeuf and Lalemant is a sacred place of Christian pilgrimage. The ruins of Sainte-Marie lay undisturbed for almost three centuries. Archaeological excavations and historical research provided the information to accurately reconstruct many of the original mission buildings seen here today. Sainte-Marie among the Hurons is part of Huronia Historical Parks, which includes Discovery Harbour.